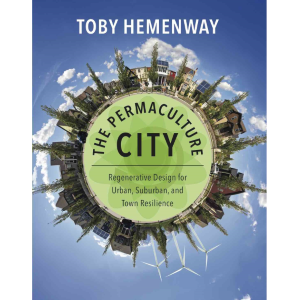 One of my constant refrains is “Permaculture is a decision making tool for arriving at regenerative solutions.” Here I’m going to show how permaculture can help create strategies for deciding what cover crops to use. In permaculture, we’re always looking for potent leverage points, and soil-building is a big one. If we create fertile, water-absorbing, biology-rich soil, a lot of higher-level problems—things like insect damage, low nutrition, poor growth, and excess water use—all go away. And cover cropping, which is the use of specific plants to add organic matter and nutrients, is a great way to build soil. I use other methods, such as composting and nulching, but there’s something about having living roots in the soil that makes cover cropping extra effective. That thick network of roots is constantly exuding sugars and other microbe food, creating a life-rich rhizosphere that pumps nutrients into plants and builds a lush habitat for mycelium and other beneficial organisms. 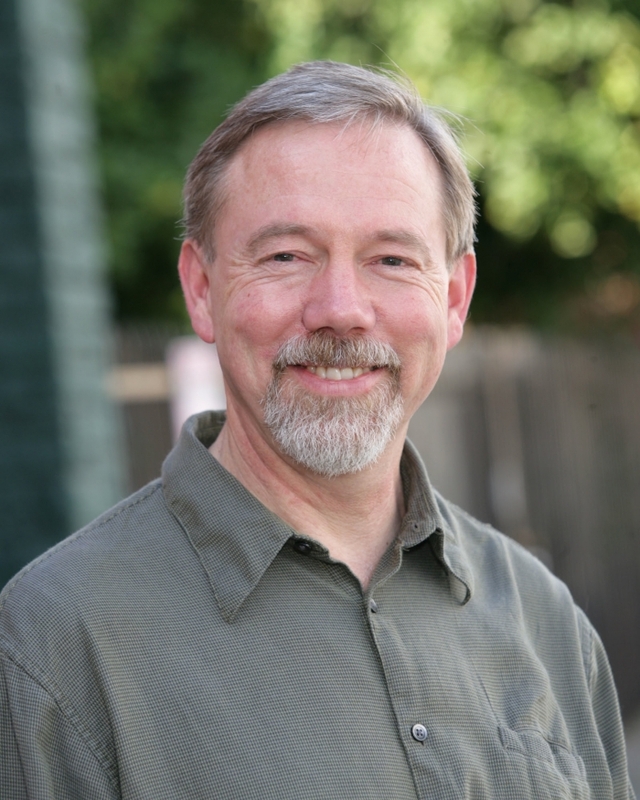 I’m going to use cover cropping to illustrate how permaculture decision-making works. How do we design a cover cropping program? Good design has three major components: setting a goal, developing strategies, and choosing techniques. First, we already have our goal: We want to build our soil’s fertility, organic matter, and tilth. There are many strategies for reaching this goal. (A strategy is simply a plan, or, as management consultant Henry Mintzberg puts it in my favorite definition, a strategy is a pattern in a stream of decisions) Different strategies for soil building include composting, sheet mulching, chemical fertilizers, organic fertilizers, cover cropping, and several more. It may seem like those are techniques rather than strategies, but I think of them as strategies because there are so many different ways of doing each. Do any two people build a compost pile in the same way? And we have many different kinds of cover crops, and a host of ways to use them. That’s why I think of each of those as a strategy: Just because we’ve arrived at cover cropping as a way to build soil, we’re not done with making decisions. There’s a “lower” or more fine-grained level that we need to make some choices about. We need to choose the specific variety of cover crop, how and when we will plant, and how we will get that cover crop into the soil, such as by tilling, chop-and-drop, or harvesting and composting it. So we need to have some criteria in mind to help us make those decisions. That’s one of permaculture’s strong points: It gives us tools that remove a lot of uncertainty from making decisions. That lets us rest in the near-certainty that we’ve made appropriate choices. To start that decision-making process, we first gather up information about cover crops—we make lists. The first obvious list to make is simply a compilation of all the varieties of cover crops that can grow in our conditions. A little Googling will get us there. One of my top sources of cover crop information is Peaceful Valley Farm Supply (https://www.groworganic.com). They ‘ve got a huge assortment. But a simply list of cover crop species doesn’t get us very far. We need to break it down into some categories, because we can’t just plant any old cover crop; every soil has specific needs and conditions. Fortuitously, the drop-down menu on cover crops at the above link has already done some category-making for us. They’ve divided cover crops into fall-planted or cool-season types, warm-season types, and year-round varieties. These categories give us a handy machete to begin chopping our way through the cover-crop thicket. What other categories will be useful in choosing cover crops? Another big dividing line is between plants that fix nitrogen and those that don’t. Nitrogen-fixing cover crops are varieties that have a symbiotic relationship with specialized bacteria that can take gaseous nitrogen from the air, which plants can’t use, and transform it into nitrate, nitrite, or ammonia, which plants can take up as fertilizer. Non-nitrogen fixing cover crops are important too. They build biomass and add carbon to the soil, which feeds beneficial soil organisms, helps retain moisture, lightens and fluffs heavy soil and—oh, right—alleviates climate change by pumping carbon dioxide out of the air and storing the carbon in the soil. Most cover crop blends contain a mix of N-fixers and non-N-fixers. A third division, near and dear to permaculturists, is that between annual and perennial cover crops. Annuals are great if we’re going to till in the cover crop or follow the cover crop with something else. But there’s a role for perennials, too, in paths or between rows of production crops, or as a constant biomass source. In a perfect world, all gardeners and farmers would be generating their own fertility on-site, not importing it from somewhere else that might be impoverished by the constant drain of organic matter. Ecological garden guru John Jeavons says that we should be dedicating roughly four to six times the area of our food garden to fertility crops to cover what we withdraw from harvesting. Before the fossil fuel era, most farms allotted more land for fertility production in the form of pasture for generating animal manure than they did for food production. We could come up with other categories, such as soil preference (clay, silt, sand), frost hardiness, and so forth, but the three I’ve outlined above are the ones I use most often. Those categories create a two-by-two-by-two matrix or three-dimensional chart that really helps to zero in on the right choices. Let’s build that chart. Next we need to organize these by dividing them up into our matrix. We’ve got 3 categories and two choices in each category. A or P: annual or perennial. 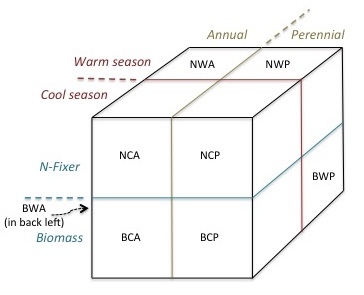 BWP (Biomass, warm season, perennial). And now we need to split our cover crop variety list into those eight categories. I’ve created a table, below, with the cover crops divided into annuals, perennials, N-fixers, and biomass plants, but having spent more time on this post than I intended to, I haven’t divided them into warm and cool weather crops. Sample cool weather cover crops are fava beans, winter wheat, and vetch. Warm weather cover crops include alfalfa, sudan grass, and buckwheat. Interested readers can use the catalog and tables from Peaceful Valley Farm Supply or other sources on the web to create the remaining categories. Or maybe I’ll get around to it someday. I hope you find this useful. Permaculture really can be a great decision-making tool. Many years ago as a child, I spent 2 weeks in the Palomar Mountains of California. The trees had a “black fungus” on them and I decided to write my Dear Uncle Jim a letter about what I had seen and to see if he could tell me what it was since my Palomar camp guides had no idea. My Uncle Jim “Cook” sent me a ton of materials and I’ll always remember my mother’s response; “He didn’t need to write a “Thesis” on it!” My Uncle changed my world with his “Thesis”. He took the time to collect information that he was passionate about and he shared it with me. To this day his passion for this earth has never faltered and I love him with all my heart for his caring. Your a special blessing and soul Toby Hemenway. I hope and I pray that your passion stays strong and connected. What an excellent post! I share Sheri’s appreciation for your wonderful way of teaching patterns, making a wealth of information applicable and life enriching. And I love the definition of ‘strategy.’ You made that word less daunting. Wonderful Toby. Very nicely organized. What a gift. Thank you. Last year was my first year having my own yard or a garden. In an attempt to try to implement some permaculture principles that I really don’t know much about I had read to plant cover crops and so I planted white clover all over all my herb spirals and all keyhole gardens and between them. I realise now I should maybe not have planted them everywhere where I wanted veggies etc to grow too. How do I prevent the clover from coming back in those areas or what can I do so it doesn’t take over so much? It did help with moisture and weed control but was really aggressive and crowded out some of the vegetables. Any suggestions? Thank you! We did the same thing with red clover & are wondering the same as you now … we’d love suggestions too …. this is what we are trying this year as an experiment. cutting clover short, thinking that roots will be less deep & allow veggies some space. Our strawberries seem happy to grow interspersed with the clover … extra big & more strawberries… just a little more looking through the clover to find the fruit.